Left to Right: Harper County Commissioners Jim Gates, Lee Adams and Carla Pence present a check to HCCF Chairperson Kevin Alexander. Also pictured are HCCF Board of Directors Roy Davis, Tom Conrady, Tim Penner, Lisa Mathes, Don Jensen, Virginia Martin and Alan Allenbach. Those unable to attend from the HCCF Board were Carol Jean Martin, Sloane Freeman and Kerry Schroeder. 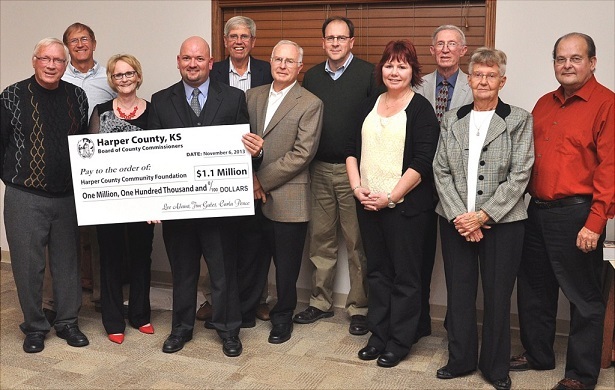 Harper County Board of Commissioners made a presentation of $1.1 million to the Harper County Community Foundation in an agreement to create a permanent reserve for future generations of Harper Countians. The presentation was made during HCCF’s End of the Year Gala and Awards Presentation held on Wednesday, November 6th, 2013 at 7 p.m. in the Community Room of the Westview Apartments in Harper. Currently, the Board of County Commissioners budgets $200,000 per year from the Plum Thicket Landfill funds to HCCF. These funds are distributed twice a year (May and October) through HCCF in the form of grants to non-profit community projects throughout Harper County. The agreement established for this permanent reserve is that there will be monies going into this fund quarterly while the principal amount will never be spent. In the future, the interest earned can then be used for the “for public purpose and in a manner which promotes the public welfare” in Harper County. In essence, this reserve will provide the County the ability to award these grant rounds for years to come. The initial investment of $1.1 million into this fund represents 10% of monies taken into the county from Plum Thicket. Going forward, every quarter, when the county receives their check, 10% will then be distributed to this fund.